Raspberry Pi Hits a Slight Manufacturing Delay – Carpet Bomberz Inc. The $35 Raspberry Pi “Model B” is board of choice to ship out to consumers first. It contains two USB ports, 256 MB of RAM, an Ethernet port and a 700 MHz Broadcom BCM2835 SoC. The Videocore 4 GPU within the SoC is roughly the equivalent to the original Xboxs level of performance, providing Open GL ES 2.0, hardware-accelerated OpenVG, and 1080p30 H.264 high-profile decode. via Raspberry Pi Hits a Slight Manufacturing Delay. Raspberry Pi boards are on the way and the components list is still pretty impressive for $35 USD. Not bad, given they had a manufacturing delay. The re-worked boards should ship out as a second batch once they have been tested fully. It also appears all the other necessary infrastructure is slowly falling into place to help create a rich environment for curious and casually interested purchasers of the Raspberry Pi. For instance let’s look at the Fedora remixes for Raspberry Pi. 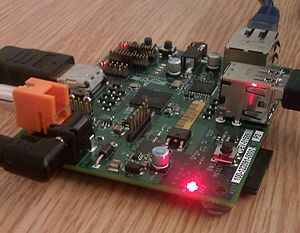 A remix in the Open source software community refers to a distribution of an OS that can run without compiling on a particular chip architecture whether it be the Raspberry Pi Broadcom chip or an Intel x86 variety. In addition to the OS a number of other pre-configured applications will be included so that you can start using the computer right away instead of having to download lots of apps. The best part of this is not only the time savings but the lowering of the threshold to less technical users. Also of note is the particular Fedora OS distributions chosen LXDE and XFCE both noted for being less resource intensive and smaller in physical size. The documentation on the Fedora website indicates these two distros are geared for older less capable, less powerful computers that you would still like to use around the house. And for a Raspberry Pi user, getting a tuned OS specifically compiled for your CPU and ready to go is a big boon. trying out different software pre-compiled for the Raspberry Pi computer.